I can’t believe it’s already been 18 months since my partner, Jon, and I made the move to Portugal. We’ve no regrets at all…time sure moves fast when you’re having fun! We joined a local walking group in our new home town on the Silver Coast, just an hour from the capital city of Lisbon, and where we enjoy spectacular views over the Atlantic Ocean. The walking group meets once a week at different points along the coast. It’s a great way to meet both locals and expats, make new friends, and keep fit. The walks aren’t too long—just five to six miles—but the scenery is lovely, and it’s a great way to socialize. Many of the walks end up at a local bar or café for lunch. There aren’t many Americans around here, but we have made many new friends from the U.K., France, Germany, Belgium, Rwanda, and of course, Portugal. It’s great going out to a local restaurant and hearing so many different languages around the dinner table, and yet somehow we all understand each other. 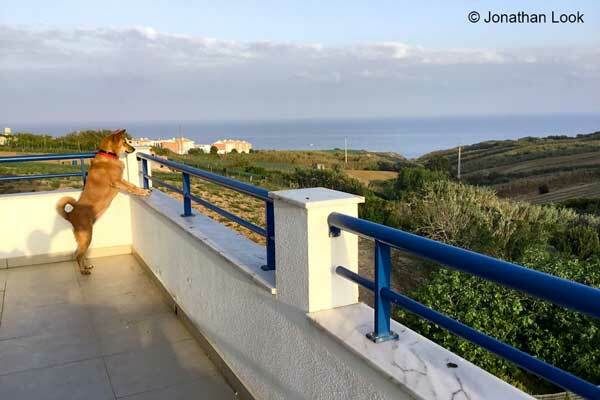 Sarah and Jon’s dog enjoying the Atlantic Ocean view from their home. I’ve been taking Portuguese lessons. Like any new language, it can be a little tricky, but it’s fun practicing in the local markets and shops. I meet my Portuguese teacher twice a week, and practice speaking over coffee and a pastel de nata, Portugal’s addictive custard tart. Local people really appreciate it when you try to speak Portuguese, and we sometimes have a good laugh at my pronunciation, which actually gives them the courage to practice their English too. The lady in our local minimart even helps me with my homework, and in return, I help her kids with their English. Jon and I have also been exploring more of Portugal. With its excellent road network, it’s such an easy country to get around. 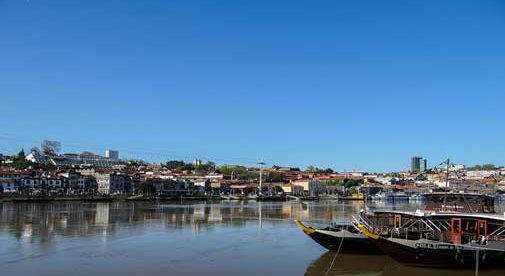 Recent trips include Porto, a beautiful old city in the north of the country…sampling the wines of the Douro Valley…strolling under the Umbrella Sky in Agueda…and trying out the traditional cakes in Aveiro, Portugal’s answer to Venice. Many hotels and guest houses in Portugal are dog-friendly, so Angel, our rescue dog, often joins us on our adventures too. We have also been exploring the Alentejo region of Portugal as a potential place to move to when our rental contract here expires next year. We are also toying with the idea of moving to a medieval castle town on the border with Spain. There are so many options. Something else that we really like about living here in Portugal is how easy it is to pop across to Spain for great tapas. We recently spent a fantastic weekend in Seville, hopping from one tapas bar to another, and enjoying flamenco dancing. Breakfast in Portugal, lunch in Spain…yes, it’s that easy. With the open borders in Europe, road trips are fun and stress-free. Talking of road trips, we have just come back from a great three weeks driving through Spain, across the Pyrenees, to the south of France, where we did a canal boat trip along the Canal du Midi. It was great fun. I’ve been documenting many of our adventures in my blog, called Life Part 2. Well, it’s time to head down to the local market now. Once a week, there’s a fabulous antique market in town, and it’s always interesting to see what’s on offer. So, as we say in Portugal…Até logo (See you later).